Inspire a healthy, active, outdoor lifestyle – safely in the sun. For nearly 20 years, Coolibar (koo-luh-bar) has stopped at nothing to develop the most innovative, technical and high performing sun protective apparel and accessories. In fact, we are the first sun protective clothing company to receive The Skin Cancer Foundation’s Seal of Recommendation. As trusted experts in sun safety, we know the more you’re covered, the more you’re protected, and the more you’ll enjoy a worry-free life outside. Call us fabric and design sticklers, but when it comes to protecting your skin and your right to safely enjoy the outdoors, we refuse to settle. We’ll never compromise on protection. We’ll never skimp on quality. We’ll always test our fabrics for UPF 50+ protection like your life depends on it—because it does. Welcome to health, happiness, and Coolibar life in the sun. This usually gets a chuckle, but, we know firsthand how important year-round sun protection is regardless of where you live. Minnesota ranks 4th in the nation for melanoma incidence, the deadliest form of skin cancer. * Because Minnesotans are known for year-round outdoor sports and lifestyle activities, we live outside where UV rays loom all seasons. Snow skiing, running, climbing, biking, boating, swimming, water skiing, hiking, fishing, golfing – you name it – we are fearless when it comes to weather and so are UV rays! Unfortunately, many at Coolibar have friends and family battling sun-related medical conditions, and we’re committed to their protection and safety. Enjoying days outside in fresh air is vital to overall health and wellbeing, so our sun safe styles are made for year-round UV protection. With the most innovative UPF 50+ products and fabrics designed to block 98% of UV rays and guaranteed to last a lifetime, we hope to inspire everyone to experience an active, outdoor lifestyle safely in the sun. All Coolibar fabrics have been approved as an effective UV protectant for covered areas. Coolibar is the first clothing company to receive The SCF's Seal of Recommendation. Innovative fabrics, comfortable styles and performance details. We are the leader in innovative fabrics and design technically elegant clothes for the entire family – technical fabrics and functional details in contemporary, easy-to-wear, elegant styles. We make sun protection versatile and effortless to keep up with your everyday adventures. Because Coolibar is a product with a purpose, we work closely with outdoor athletes, cancer survivors, dermatologists, medical advisors and organizations like the Melanoma Research Foundation, The Skin Cancer Foundation and the Lupus Foundation of America, for additional design insight and technical expertise. The result is a new “user group” strategy with product groupings around seven activities – swimming, golf & tennis, fishing & boating, fitness, travel, relaxing and garden party (upscale occasion styles), designed to provide maximum comfort, coverage and UV protection for the whole family. Our philosophy merges fabric innovation and styles that are classic with exceptional design details like hidden ventilation and specialized moisture management features so you stay cool, calm and covered. Coolibar’s UPF 50+ clothing and accessories are wear-tested, designed for maximum stretch and comfort, feel good against the skin and are designed for specific outdoor activities. Not all clothing is sun protective, and not all sun protective clothing is created equal. Innovation is at the heart of Coolibar’s philosophy. We’re relentless about developing fabrics that matter in contemporary styles made for movement, fitness and fun. We believe in an active, outdoor life. We've developed industry-leading fabrics with performance features like lightweight, soft, breathable, stretch, moisture-wicking, fast drying, cooling, water repellant, anti-microbial – all designed for movement, fitness and fun. Each proprietary fabric type is designed for a very specific function and outdoor activity. For example, our swimming and snorkeling fabrics are chlorine- and saltwater- resistant and dry quickly. What makes a better sun protective fabric? Technical innovation and independent third-party testing ensures our fabrics are UPF 50+. Our fabrics use a combination of weave (tighter is better), color, weight and additions of the best active ingredients found in sunscreens, millions of the sun-bouncing minerals, titanium dioxide and zinc oxide infused at the fiber or fabric level. Even with multiple washings and exposure to sweat, chlorine and salt – our sun protection never washes out. We NEVER say SPF. Fabric is UPF. Lotion is SPF. If you see clothing brands labeled as SPF protection, it’s not accurate for fabrics. SPF stands for Sun Protection Factor which measures the amount of time it takes for sun-exposed skin protected with sunscreen or lotion type products to redden from UVB (“burning”) rays. UPF is a broad-spectrum UVA and UVB measure for fabric, and it rates the amount of UV radiation that penetrates a fabric and reaches the skin. A garment with a UPF of 50 only allows 1/50th of the UV radiation falling on the surface of the garment to pass through it. It blocks 49/50ths or 98% of the UV radiation. Clothing brands that cite SPF are not full spectrum protection. Isn't My Cotton Tee Enough? In a word, no. An average cotton t-shirt may not safeguard you at the beach, let alone on the street. When dry, a white cotton t-shirt only provides an ultraviolet protection factor (UPF) of 5-7*. Even worse, when wet from the pool, the protection level drops to about UPF 3, exposing us to UV radiation we may be unaware of. Today, 90% of skin cancers and premature aging are a result of compounded UV exposure. Coolibar’s ZnO t-shirts, polos, tunics, cover-ups, dresses, hoodies and pants are super soft, comfortable and UPF 50+, blocking 98% of UV rays wet or dry. All our fabrics are guaranteed UPF 50+, from the first time you wear our product to the day you retire it. Since UV damage is cumulative and irreversible, starting kids and teens with UPF clothing provides the best option when it comes to outdoor activities. With ultra-soft fabrics, like our ZnO, kids fall in love with Coolibar t-shirts which we design to keep them sun safe year-round. Why are clothes called UPF instead of SPF? Between UPF and SPF, the concept is essentially the same, to protect your skin from ultraviolet radiation. What SPF is to lotions, liquids and serums, UPF is to fabrics and clothing. SPF only measures sunscreen protection from UVB rays, the burning rays. When applied correctly, SPF 30 blocks 97% of UVB rays. UPF 50+ measures light transmittance, blocking 98% of UVA and UVB rays. Coolibar fabrics exceed all published American and Australian standards. How is Coolibar ZnO t-shirt fabric developed? ZnO is our unique blend of cotton, bamboo viscose (a natural UV fighter) and spandex fabric, embedded with millions of zinc oxide minerals at the fabric level. Zinc Oxide protects against UVA and UVB rays and has many skin comforting qualities, often used on the most sensitive skin types. So soft and soothing, our Coolibar ZnO t-shirts are sure to become your everyday favorite. Tested more than any other brand, endorsed by experts worldwide and recommended by dermatologists - Coolibar guarantees UPF 50+ protection in our fabrics from the first day our product is worn until the day your garment is retired. It’s vital that all our clothing is UPF 50+ so everyone can live outside safely in the sun. Many UV brands only measure themselves against one standard for UV safety, while we invest in testing all our fabrics multiple times against multiple UPF standards for UV transmittance and safety. UV rays react differently to colors, patterns and fabrics, so we are cautious and use a protocol of testing every fabric we make in every color and pattern we create. And we do this for every season, every collection and every new production run. We use independent, third-party testing to evaluate fabric samples three times over and measure performance against U.S. standards as well as Australian/New Zealand UPF rating standards. That means, when you’re wearing a Coolibar shirt, we can report the testing data to on fabric it was made from. The “+” means our fabrics are tested at highest possible UPF 50+ standards. Testing evaluates UV transmittance before and after life cycle tests – laundering, sunlight and chlorinated water. 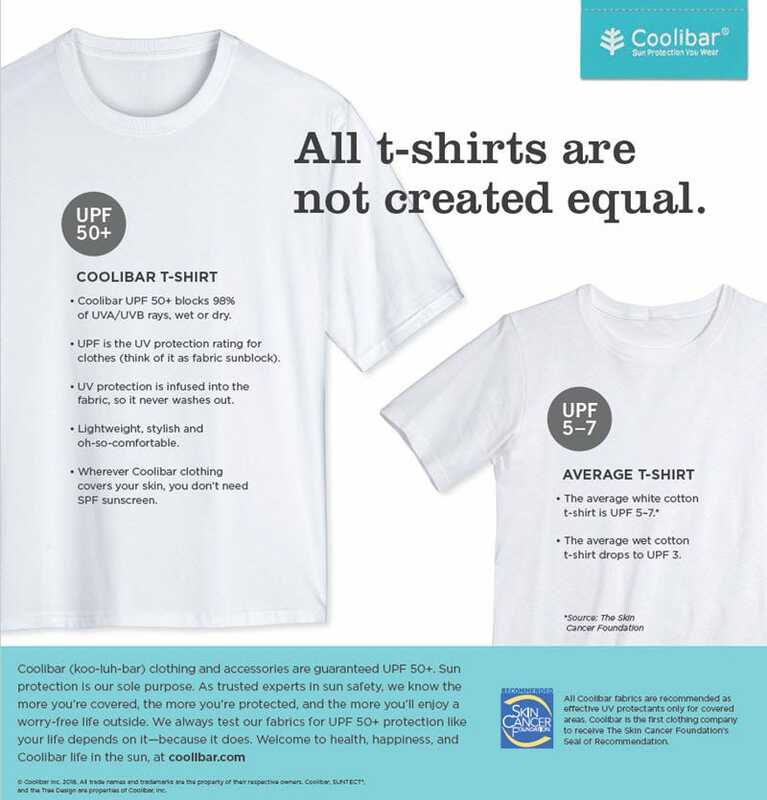 Coolibar’s level of sun protection is measured against all worldwide published rating standards for UPF 50+. We’ll always test our fabrics for UPF 50+ protection like your life depends on it – because it does. It’s like effortless sunscreen you wear. Sunscreen on exposed skin is essential, but clothing doesn’t rinse off, isn’t applied too thin or incorrectly and doesn’t need to be reapplied. Coolibar sun protective clothing is a physical barrier between your skin and the sun, blocking 98% of all harmful UVA and UVB rays that cause or contribute to skin cancer and directly to aging (brown spots, skin sagging and wrinkles). Incidence of skin cancer is on the rise. Over the past three decades, more people have had skin cancer than all other cancers combined with nearly 5 million cases treated each year; Coolibar is dedicated to changing these statistics. This year, one in five people will receive a skin cancer diagnosis, and we believe Coolibar is an integral part of the solution, as clothing is “the single most effective form of sun protection” according to The Skin Cancer Foundation. With technology designed to keep you cool on a hot day, Coolibar provides maximum UV protection to match your outside living. Coolibar apparel is effortless sun protection you wear, because wherever our clothing covers your skin, you’re UV protected. Start young for a lifetime of safety. Since UV damage is cumulative and irreversible, starting kids and teens with UPF clothing is a smart health habit. With super soft fabrics like our proprietary ZnO, they can fall in love with Coolibar tee-shirts that keep them safe year-round, on the playground or at recess. By using proper UPF 50+ tennis and golf clothing on the court and course, they can spend hours practicing and playing while protecting their skin. Even the pool becomes a safe haven for swim lessons when kids wearing UV swim suits, like Coolibar UPF 50+ swim shirts, rash guards or swim shorts. With proper sun protection, skin cancer is also one of the most preventable cancers.